This dish is fairly quick, can be made hours or days ahead, and will bring you and your guests within inches of Heaven. You can only get to Heaven, once you’ve left your body, which we don’t want this recipe to precipitate. If anything, this dish, reminds you of how great it is to have taste buds and be ALIVE! I learned this recipe from my daughter Shira who got it from her Israeli-Italian grandmother (Sapta Rachel Heller). She is an amazing artist and cook and all credit should accrue to her for this dish! If the eggplant is fresh you can skip this step, if not, you need to do the following: Salt the eggplant rounds in a strainer and let them sit for a 1/2 an hour or so. When you salt them ahead of time make sure you pat each piece dry of the sweated salty liquid before you fry them in the oil. You will need to use less salt in between your layers if you do this step. Have all your ingredients ready and in bowls nearby before you begin. Heat ½ an inch or more of good olive oil, a fairly liberal amount, in your heavy cast–iron skillet or in a good non–stick one. 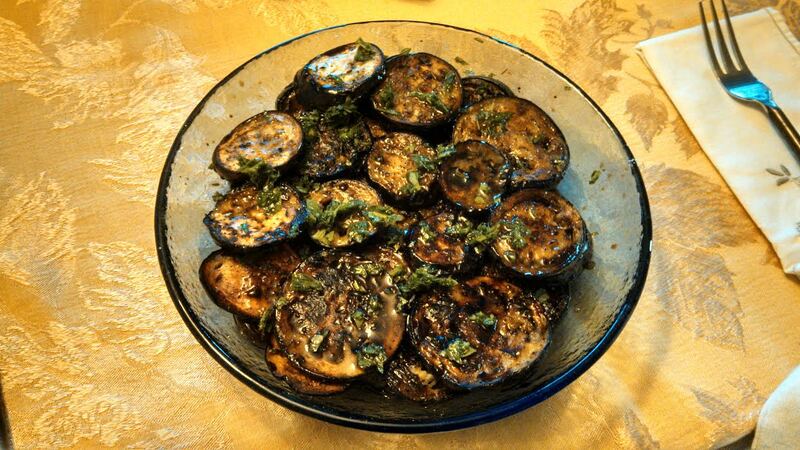 Sauté the eggplant circles until they are reddish/dark brown on both sides. You may have to heat up more oil to finish all your eggplant slices. Have an attractive glass serving dish with a rim of at least an inch on it, or a small sort of casserole or round deep dish pie plate next to your stove. Remove each piece of eggplant, once it is cooked, and place it in a single layer on the bottom of your dish. Add a sprinkling of the sea salt, a liberal sprinkling of the parsley, freshly ground black pepper, and sprinkle each round with balsamic vinegar, so that each round is getting a light shower of the stuff for each single layer. Repeat this process with each layer until all of your eggplant is cooked, and layered. On the final layer, drizzle a little bit more olive oil. This dish should marinate or sit for at least 1/2 hour, and is best served warm or at room temperature. If you are going to put it in the fridge please remove it a few hours before serving. Keep it covered with a plate or lid when it is in the fridge. Serve with a summer tomato salad, rice or on good bread. It’s hard to stop eating this one, you’ve been warned!